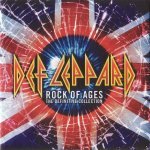 Def Leppard played a show on the Rock Of Ages tour in Brooklyn, NY on 9th July 2005 and a second fan review was sent in by Jackie. The show took place at the KeySpan Park. Three other fan reviews are available from this show. "Nevertheless, the atmosphere was unreal & song after song the crowd loved them. I was hoping Phil would perform the intro to Heartbreak as he did on the Hysteria Tour DVD, but hey, the whole concert was unforgettable. It all made me wish I had seen them live on previous tours, but you can't turn back time."